If you're in the midst of a bathroom remodeling project, you probably think you've looked at every bathtub and whirlpool on the market, but there are a multitude of products you won't find in the everyday showroom. According to Geek.com, those with plenty of funds to spare this holiday could drop $72,000 on a Corcel bathtub made from carbon fiber. This awesome piece of bathroom décor is limited to a production of only 51 pieces, so only the most affluent one percenters will be able to get their hands on one. For those who love the look of a black and white bathroom, this tub is the vessel of their dreams that can stand up to years of punishment and keep looking great. The tub is also extremely large - at eight feet long, it can hold up to 81 gallons of water. While the tub may look more at home in a science fiction movie, it shows the lengths that some consumers will go to find the perfect accent for their washroom. Of course, if you don't think you can drop $72,000 dollars on a new tub, Corcel sells the next best thing. The company also makes a carbon fiber toilet seat which could be an intriguing update for a modern aesthetic. 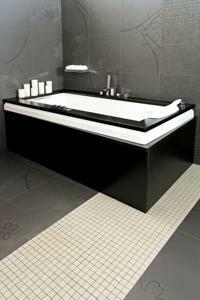 If you had the money, would you invest in a carbon fiber bathtub?